Today is the anniversary of the Treaty of Breda that brought an inconclusive ending to the Second Aglo-Dutch War and a temporary halt in the hostilities between England, the United Provinces, Denmark and France, who immediately started invading the Spanish Netherlands. Let's face it, for most of modern European history it was France, not Germany (which did not even exist till 1870) that was the "neighbour from hell". While the Dutch were victorious around Europe and in Asia, England won in North America with four new colonies, New York, Delaware, New Jersey and Pennsylvania. This marked the end of Dutch ambitions in that part of the world. Tory Historian is very fond of St Pancras station, its combination of exoticism with the Eurostar trains and the longest champagne bar in the world with the more homely commuter trains and the large shopping, eating and drinking area. One of the best sights is this charming statue to Sir John Betjeman, poet, writer, campaigner and all-round Good Egg, besides the Eurostar trains. 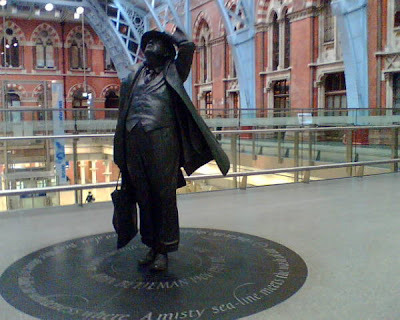 Around the statue it is written: Sir John Betjeman 1906 - 1984, Poet and Saviour of this glorious station. A great memorial even apart from his poems. Well, at least, not to the sword as would have happened in centuries past. It is always pleasant to receive any kind of response to postings, even if they arrive more than a year later. A recent e-mail about last March's blog on Sir Edwin Lutyens did make Tory Historian feel reasonably happy that there were readers around who took the trouble to write but also bitterly ashamed about two unspeakably bad mistakes. In the first place, there must have been gremlins in the system on the day and Sir Edwin's name appeared as Sir Edward in the title and in the text. Ashes and sackcloth, methinks. There is something ineffably English about Sir Edward’s family life – the five children, born despite a less than happy marriage; the dottiness of his wife, Lady Emily Lutyens (later Lady Lutyens), who had actually proposed to him and insisted on the marriage and who later became fascinated by theosophy, Eastern religions (only some of them, one presumes) and Juddu Krishnamurti; the children, some of whom turned out to be completely conventional, some less so. It seems clear to Tory Historian that the intention was to write Lady Emily Lutyens somewhere in that sentence rather than later Lady Lutyens but those gremlins worked hard. More ashes and sackcloth. The fact that other people made the same mistake is not an excuse. As a propitiating act, Tory Historian would like to draw attention to the site of the Lutyens Trust that deals with Sir Edwin Lutyens, his work and his family in some depth. The last surviving British veteran of the trenches has died at the age of 111. Harry Patch, whose death was announced today, fought at Passchendaele where more than 70,000 British soldiers were killed. The total number of casualties was: on the British/French/Commonwealth side 508,800 dead, wounded, missing, or captured and on the German side 348,300 dead, wounded, missing, or captured. Tory Historian sincerely hopes that Mr Patch will not be insulted in death by the sort of silly, patronizing comments various people and politicians made after the death of Henry Allingham. The last remaining British veteran is Claude Choules, 108, who lives in in Australia. He was a seaman and is a veteran of both World Wars. There have been several offers of articles of great interest for the Conservative History Journal but I am happy to hear from more potential authors. And a bonus: a blog I did not know but now do. It is called Burke's Corner and views the world from a Burkean perspective. How can one resist? Tory Historian received a link to a potentially very interesting project. Well, the link itself is to a website that concentrates on war, soldiers and public health. The project, funded quite handsomely by the Arts and Humanities Research Council (AHRC), aims to put together the military and health records of 250,000 mediaeval soldiers between 1369 and 1453. The aim is, naturally enough, to challenge something or other and the group of academics that is involved may even do that. But what Tory Historian is looking forward to is finding out what those difficult mediaeval diseases were in reality. What did Henry V die of? Dysentery or something else? ... a review copy of what looks like a most excellent book: "The Game Cook" by Norman Tebbit. Oh yes, indeed, that Norman Tebbit, who is a keen shot and an even keener cook of things shot. Published by JR Books who seem to specialize in Hollywood biographies but do diversify from time to time, it is a collection of Lord Tebbit's favourite recipes with attached musings on matters culinary and sporting. There are also excellent illustrations by Debby Mason of the game while it is still alive rather than after it had been cooked. She is, apparently, a keen diver and there are a few seafood recipes in the book as well as ones for wild salmon. No, no, not the insipid farmed stuff. The story behind the books is interesting. Lord Tebbit is now the chief cook and provider of food in the household as his wife Margaret has been in the wheelchair since the Brighton bomb. One day he asked his butcher why people bought rubbery chicken in the supermarkets, sometimes paying premium price for the "organic" or "free-range" label instead of going for the far tastier game birds who would have had a better life. The butcher thought it was because people were afraid, never having cooked game. From past experience of being Director of the Honest Food Campaign at the Countryside Alliance I can support that opinion. People are afraid of game; they also view it in a rather muddle-headed fashion as "posh" food though pheasant is no more expensive than some of the fancier chickens. Nothing daunted, Lord Tebbit decided to address the issue. [Warning: Jan Moir, the FT interviewer in that links shows herself to be incredibly silly but Tebbit is on good form.] This book is the result. Now, I have no doubt that I shall receive many requests to review it for the Conservative History Journal. (By the way, how are those submissions coming along?) But this is editor's privilege. I shall be writing about the book as I progress with the reading and the cooking. ADDENDUM: Anyone who is likely to be at the Game Fair this week-end (sadly I shall not be) can get a signed copy. On July 20, 1944 Colonel von Stauffenberg placed a briefcase with a bomb under a table next to Hitler in a meeting room in the latter's headquarters, known as Wolf's Lair. The bomb did explode but for a number of reasons did not kill Hitler. In fact he sustained but minor injuries and could broadcast his gratitude to fate that had spared him that evening. The conspirators were mostly high-ranking army officers who had had doubts about the whole Nazi enterprise for some time and were now convinced that the war would destroy Germany. They were anxious to get rid of the Führer and to start negotiations with the western allies and to save Germay from total destruction and probable Soviet invasion. The plot, as we know, failed and the conspirators were arrested, tortured, tried hastily and either executed (some with piano wires) or, if they were lucky, given the chance to commit suicide. Would the western allies have negotiated? Given Churchill's and Roosevelt's readiness to give in to Stalin's every demand and, in the case of Soviet POWs and DPs, go beyond those demands, that scenario is very unlikely. We can but speculate. And no, Tory Historian has not the slightest intention of watching Tom Cruise playing a Prussian aristocrat, especially as there is no mention even of the curious role of Otto John, one of the few survivors of the conspiracy, subsequently head of "West German Federal Office for the Protection of the Constitution - protection, that is, against extremists of Right or Left, a German equivalent of MIS", then a defector and counter-defector. Or maybe not. Tory Historian agrees that the passing of Henry Allingham, the oldest man in the world and the oldest British veteran of the Great War, at the age of 113 is, indeed, a solemn occasion; a time for us all to meditate on that war, its horrors and, perhaps even more, the horrors that followed it. The short twentieth century was not a happy one for most of the world. On the other hand, Tory Historian is a little puzzled by comments seen on various outlets about what a lovely fella Mr Allingham was or how marvellous he was or others of that ilk, made by people who patently have no idea and have never heard of Mr Allingham until his death. I had the privilege of meeting Henry many times. He was a tremendous character, one of the last representatives of a generation of tremendous characters. He lived in Eastbourne for much of his life and was a much-loved local figure. He always had a roguish sense of humour and we're all going to miss him hugely. He always had a joke and loved all the attention. Tory Historian finds all this very distasteful. This one is from Benjamin Franklin, one of Tory Historian's heroes, a man who was in most ways a conservative even if he found it necessary to side with the American rebels. And while we are on the subject, let us hope that readers of this blog have not forgotten about Benjamin Franklin House in London, near Charing Cross station. Do politicians ever keep their promises? That may be a rhetorical question with the answer being no in all cases but there must come a time, says Tory Historian, when even a politician is held to his (in this case but let us not be sexist) promises. Tory Historian has a distinct memory of Boris Johnson, at present Hizonner the Mayor of London, promising in his electoral campaign to deal with the vexed issue of the Fourth Plinth in Trafalgar Square, one of the few matters that do lie within the Mayor's competence in a sensible fashion. There was going to be a statue of Air Chief Marshal Sir Keith Park GBC, KBE, MC and Bar, DFC, RAF, the man who was in direct command of pilots and those who assisted them during the Battle of Britain; the man who was responsible for the defence of London; and one who has no proper memorial in Britain. Indeed, a model was produced by the sculptor, Les Johnson and it seemed to all who are genuinely interested in what happens in Trafalgar Square rather than those who bleat about the latest trends taken up by the art establishment or about it all being so much fun having jolly rubbish on the Fourth Plinth, that the statue would be appropriate both artistically and historically. Westminster council officials say the proposed statue of Air Chief Marshal Sir Keith Park would clash with the changing series of contemporary sculptures on the fourth plinth. Councillors will decide on Thursday whether to accept their recommendation. The planning report says the bronze statue would have an "adverse impact" on its surroundings because it is too representational and traditional. Tory Historian could not believe that there was anybody in the whole world who could spout this rubbish. An adverse impact on its surroundings? Have these people been to Trafalgar Square? Do they realize what sort of adverse impact plastic shelving (the last exhibit) or moronic narcissists getting up on the plinth to be filmed for an hour at a time have on the surroundings and on the mental welfare of passers-by? Is it not time Hizonner the Mayor started thinking about fulfilling his promise or explaining that he cannot do so because he has not got the power? Today is the anniversary of the Battle of the Boyne, the decisive encounter between William III who had been invited by the English Parliament to reign together with his wife, Mary II and Mary's father, James II, the second Stuart to be deposed by an "unruly" parliament. The battle, won by William and his rather mixed both from a religious and national point of view forces, marked the end of James's own attempts to reclaim the throne though as every school child ought to know the attempts by Jacobites to restore the Stuarts continued well into the following century. This site has all the details. Is it an important enough date to be remembered by all, not just the people of Ulster (on both sides)? Well, probably, as the end of James's campaign established the king who was there at parliament's behest. Then again, it is the third of those dates: 1688 is the Glorious Revolution, 1689 is the Bill of Rights and only then do we come to 1690. “The Power-House” is one of TH’s favourites, combining as it does a jig-saw puzzle beginning with a desperate cat-and-mouse game at the end. The chase before safety and subsequent confrontation takes place in London, which is a particularly attractive aspect of the novel as the movements of the hero, his friend, the Labour MP and of the villains can be followed on Tory Historian’s mental map. The theme is an international conspiracy, created by a super-intelligent but utterly amoral man who is contemptuous of the inadequate knowledge and compromises that underpin civilization as we know it, that is the western variety. The various aspects of that conspiracy: crime, disorder, anarchist outrages, the odd revolution appear to most observers as independent events. There is some sense in the theme in that the events of the twentieth century proved how thin that layer of civilization really was. But the ideologies that undermined and destroyed it, that plunged many parts of the world into anarchy and monstrous oppression, were not particularly romantic and had no ultra-intelligent guiding spirit behind them. Sadly, as one looks at Nazism and Communism, the twin evils of the modern world, one must recall Hannah Arendt’s description of the Eichman trial: evil is banal. That is, of course, why reading Buchan is such joy. Would this be the same Falstaff? Tory Historian is used to being puzzled by critics’ comments about some film or play and wondering whether they had seen the same one. Usually, one can dismiss such discrepancies by assuming that the critic in question is probably quoting some semi-literate hand-out written by a PR person who had most certainly not seen the work in question. However, when it comes to serious historians writing about very well known plays and characters in a way that suggests there is a certain lack of understanding, the puzzlement increases. She describes the “cultural wars” (an anachronism, of course, but one can see why Ms Field is using it) around the theatre and gives a detailed though to some extent imagined account of a group visit to a performance at the theatre in Lincoln’s Inn Fields of a play that has Sir John Falstaff in it. As this could be one of three, a little more explanation would be useful but the documents she quotes, including a poem by Matthew Prior, refer merely to the actor Betterton playing the fat knight. It is significant that the Kit-Cats so honoured Falstaff, a character moderating tragedy with comic excess and abundance, resilient in his frivolity, regenerative in his adaptability and a patriotic nobleman who fondly mentors young Hal, the future King of England. Falstaff could be viewed as a hero of English paternalism and materialism, while his love of food and drink was a straightforward connection to Kit-Cat dining. Her only other quotation from Kit-Cat writing refers to Falstaff’s girth and is clearly jocular. The rest of her analysis is, if one may put it that way, tosh. Even allowing for the inexplicable opinion present in some Eng. Lit. specialists that Falstaff is the real hero of the two Henry IV plays and his rejection by Henry V is a tragedy, this makes very little sense. Let’s get one thing out of the way: Falstaff is the patron of English drunkards through the ages who think there is something wrong with eating as well as drinking. He consumes but two anchovies with a prodigious amount of sack. He is actually a Knight of the Shire, which is not quite the same as a nobleman but we can let that one pass. But patriotic? Falstaff? The man who never fights if there is any running away to do, who desecrates Harry Hotspur’s body in order to claim the reward, the man who can mentor Hal merely in drinking, wenching, lying and cheating? When Falstaff hears towards the end of Henry IV, Part II that the King is dead and his Hal will now inherit he does, indeed, hasten to Westminster but not to serve the country or the king but to leach on to England’s body politic with his deplorable friends, to get as much as he can out of his royal friend. When he is, quite properly, shown the door by the real patriot, Hal, now King of England, Falstaff collapses assuring all and sundry that he would be summoned privily later. The last thing we know of him is that he dies a broken man “babbling of green brooks”. There is no adaptability and whether one views the story as tragic or merely pathetically dramatic (in the original sense of the word “pathetic”) Ms Field’s analysis makes one wonder what else she might have got wrong.